Running out the door with my noir et or…. 🙂 parfum, Astrologie Nouvelle (from my honey at XMas), balcon de Guadalquivir, and black clicclac to match my panda necklace. Don’t get me wrong. I’m not the kind of girl who says no to some Clic Clacs. They have their time and place. With my color selection, that time and place is usually SF Giants baseball season. A girl’s got to coordinate with her home team, ya know? I have one skinny Orange/Silver and 3 fat gold trim with black, orange, and cream. The thing is, they are the easiest to knock off. I don’t trust them on ebay. I’ve found multiple fake Clic Clac sites, and if I wasn’t concerned about where my credit card number might end up, I would consider buying a couple $60 Clic-Clacs. But, well, I am concerned where my credit card might end up. 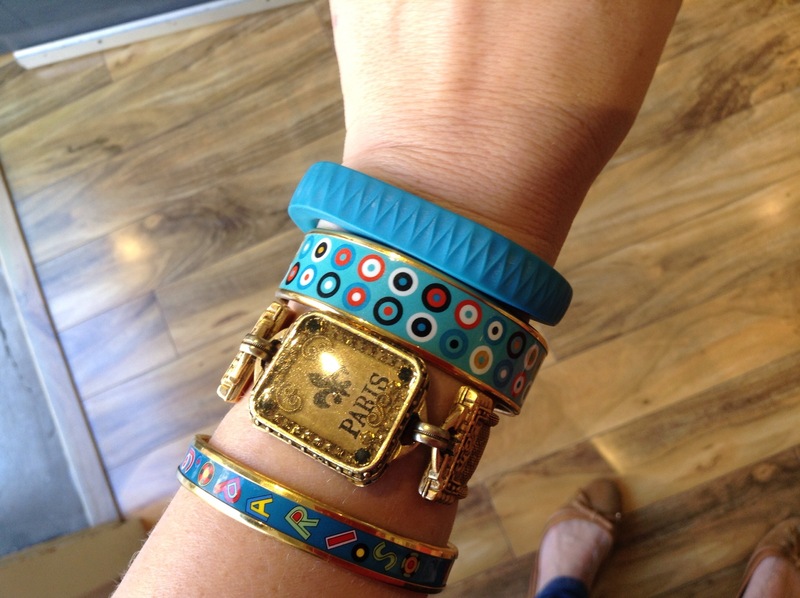 But if you aren’t, just search Hermes +Clic Clac. Tell me how it goes. 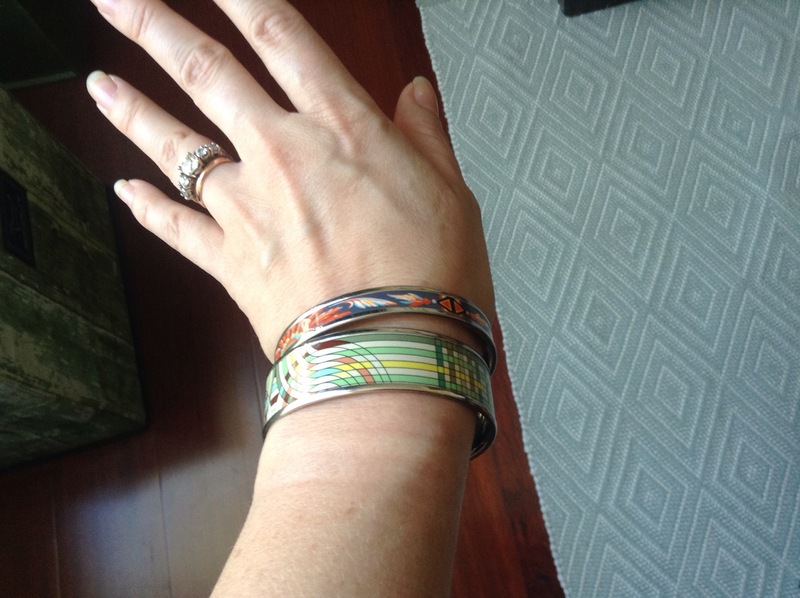 These 3 bangles were the beginning. 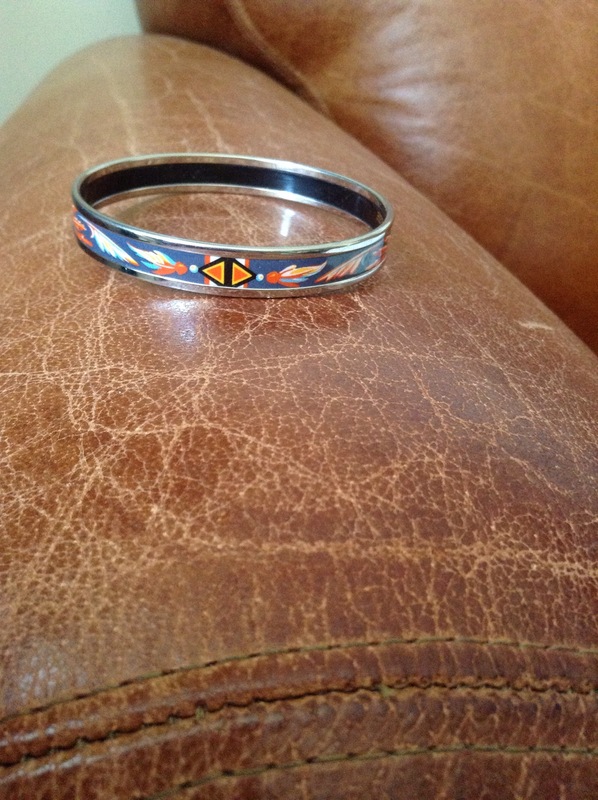 Very 80’s, very blue and red and gold, gently worn and bequeathed to me from mom who also loves the bangles. 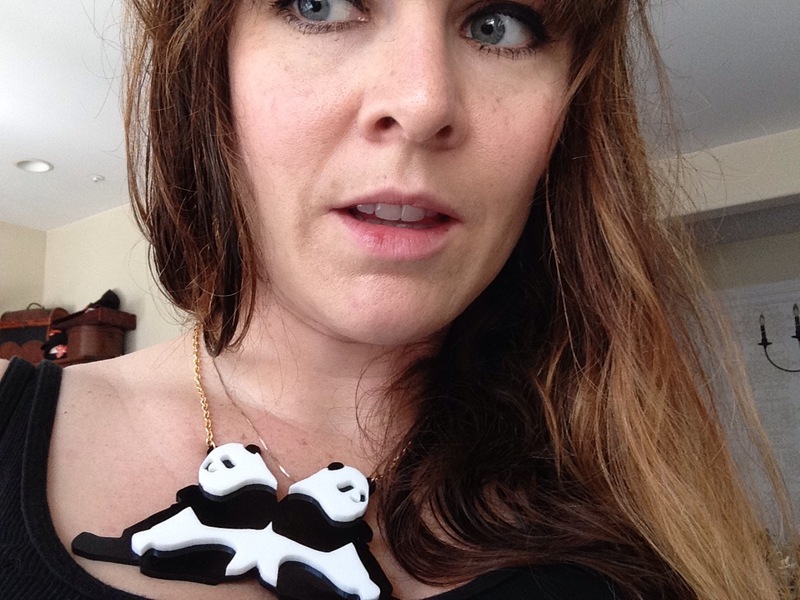 I treasure them and usually feel obliged to wear the trio together. Btw. Title is a quote from Lewis Carroll’s Alice in Wonderland. My dad has the habit of buying me the GM size, so I frequently exchange the one he’s given me for the right size. Sometimes, like this recent Christmas, Hermes is an utter mad house when I arrive so instead of special ordering the exact same pattern I’ll swap for something they have in stock. My secret fancy collection? 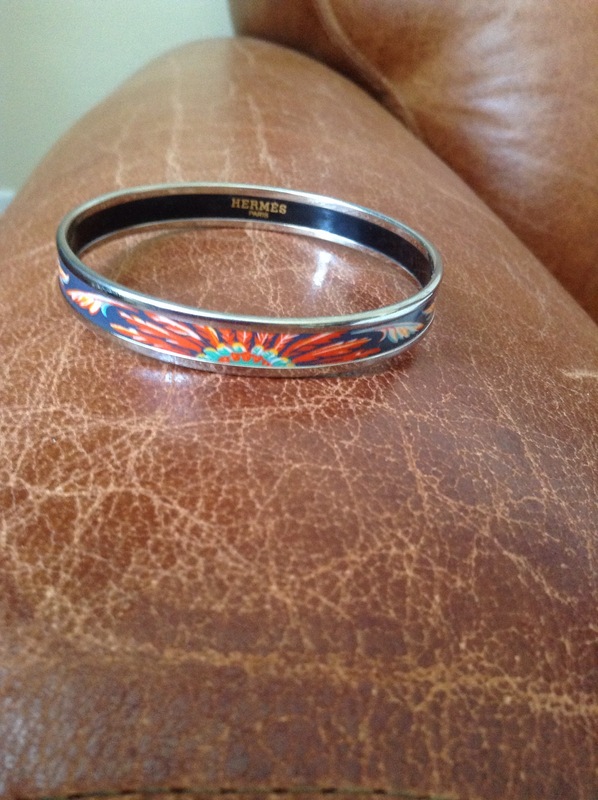 Hermes enamel bracelets (petite modele). 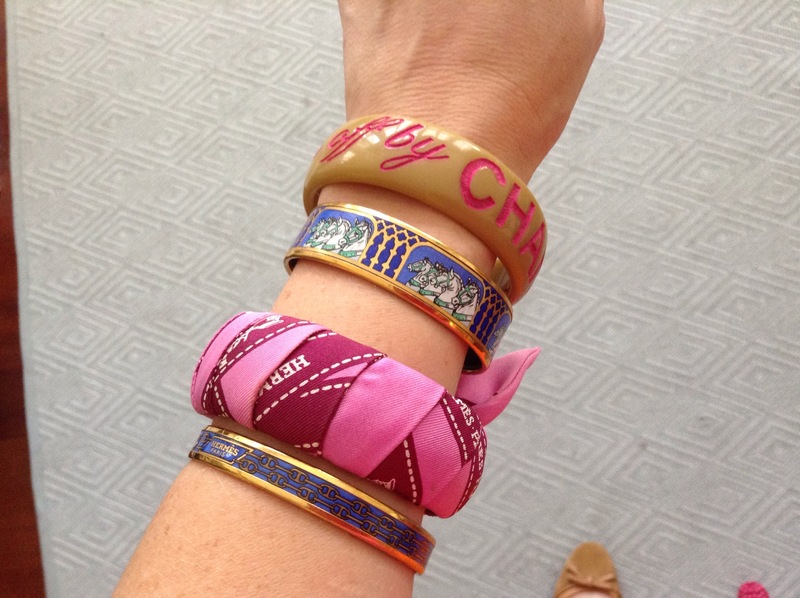 It all started when I inherited my mother’s trio of bracelets from the 80’s. Two horse profiles in red and blue and a blue chain link skinny bracelet in blue. She’s now a GM and these three are too small for her. It was a down hill (and expensive) slope from there. Now I’m guessing I have about 20 to 25 total. I usually receive one on my birthday and one on Christmas, then I stalk them on eBay, and occasionally spend a bonus on a new pattern. I love the color and the click clack they make on my arm. But what other patterns are there? 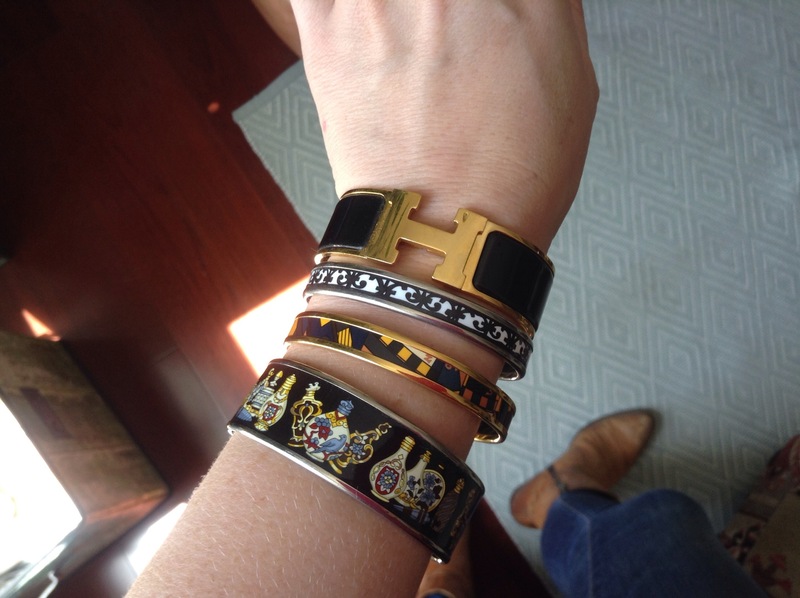 I wish Hermes published a catalog for myself and the other collector’s out there. Good lord, there must be other collector’s out there. Am I in this alone? So here is my collection. 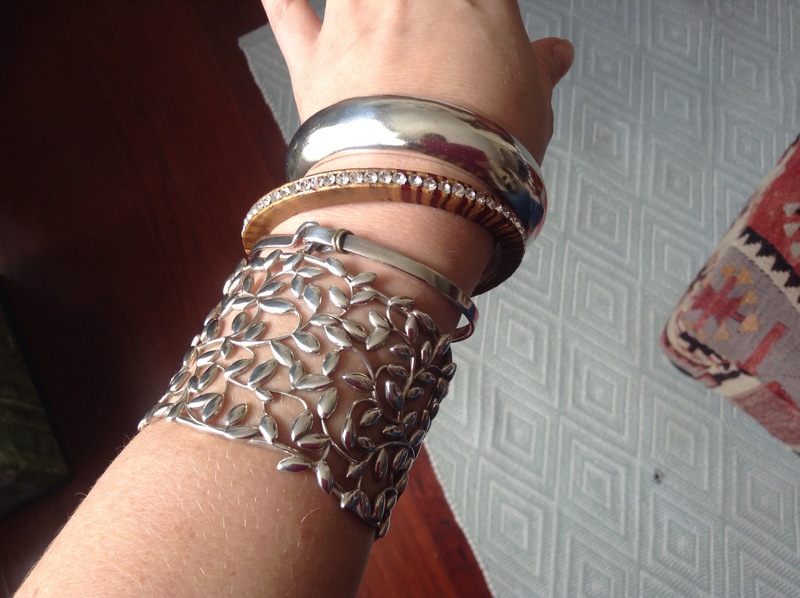 I will add the various patterns I have collected and showcase them paired with each other and other bangles that I own. Please let me know the French names of the patterns that I may not know.